It is just about every bibliophile’s dream to have a home library filled floor to ceiling with built-in bookshelves housing their growing collection of books, but how many of us actually have the extra space to dedicate an entire room to such a thing? 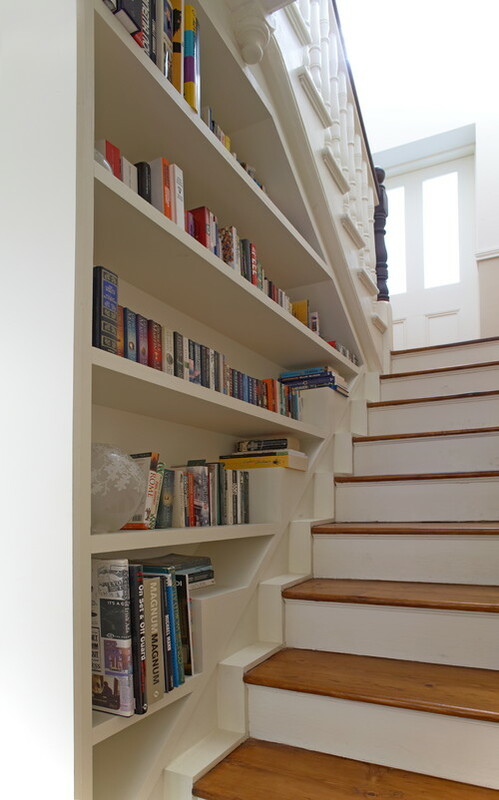 If your DC area home is short on space to store your favorite tomes, don’t give up on your dream just yet! With a little creativity and a skilled carpenter you can find space in just about any room of your home for a stylish built-in bookshelf that will suit your needs. 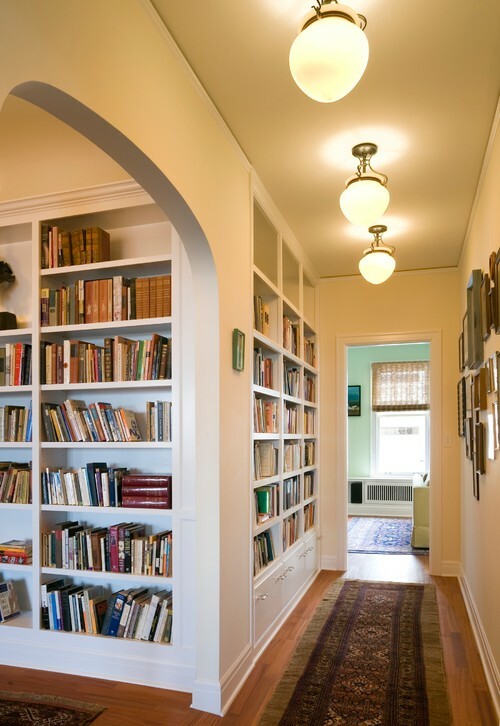 Hallways are surprisingly good spots to squeeze in a home library. This area is usually too narrow for furniture but narrow built-ins are capable of utilizing the small space without making it feel cramped. Like hallways, stairways are a walkway zone that are begging to be put to work. And since you’re always passing through these spots of your home, it makes it easy to put back an old book and pick out your next favorite read. 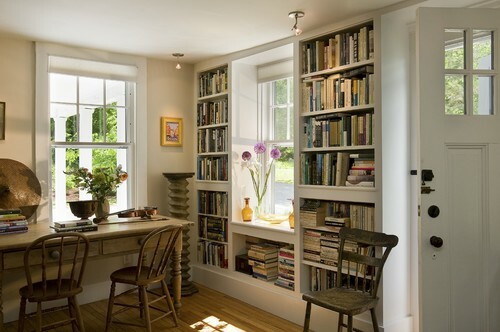 Photo by Smith & Vansant Architects PC This window makes a great spot for a built-in bookshelf. Framed by the shelves the view instantly become more important, and the space under the windowsill turns into the perfect place to display favorite items or to add a cushion for some sun-soaked reading. This smart homeowner decided to make a single room function as two by lining the walls of her formal dining room with bookshelves. If you’re designing your own built-ins, covering the lower portion of your bookshelves with cabinet doors will also create storage space for servingware that’s not regularly in use. Do you mostly read in bed at night? Built-in bookshelves lining a wall of your bedroom might be the perfect solution for your collection of hardbacks. Not only does it add visual interest and texture to your room, but it also makes it convenient to grab just one more book during a late night reading session. Similarly, combining a library wall with a guest room is another great way to put your collection on display and offer up entertainment to visitors. Are you ready to finally get those boxes of books unpacked that have been sitting around for months or even years? There are great spots all over your home that can be turned into beautiful displays for your collection, all it takes to see them is a little creative thinking! Before you start making big changes to your walls it is always a good idea to speak with an experienced contractor. They’ll be able to properly build and install your shelves to stand up to the weight of your books over an extended period of time and ensure the shelves are properly secured to the walls. Safety is an important consideration when you will be loading up a lot of weight higher than waist height. At Stohlman & Kilner Remodeling Contractors we are experienced in creating custom cabinetry for every room of your home. Call today to schedule your consultation.